« Congratulations Jan Lindgren – Senior Heroes Award Winner! My family on both my mother and father’s sides came to Colorado in the early 1890’s. My mother’s father, John Fultz, came from Illinois at the age of 17 to see if this Colorado dry climate would help with lung condition. It surely did as he lived to age 87. He settled in Saguache, CO in the San Luis Valley and became a partner in a group of cattle ranchers who called themselves the Company Ranch. One of the partners,William Whitten, became John’s brother -in-law, as they married sisters, one of which is my grandmother, Ada Trebilcock Fultz. Ada met my grandfather John when she came from Keosaqua, Iowa to visit her sister, Flora Whitten. My mother, Ethel Fultz, was born in Saguache in 1906 and lived on the homestead until age 12 when the family moved to Hooper Colorado, some 30 miles south. John wanted to go out on his own, farming and raising both sheep and cattle. 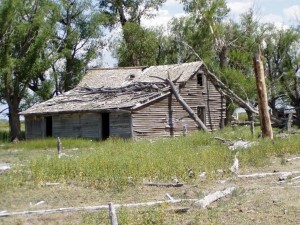 The old homestead near Saguache is still standing although unoccupied since the mid 30’s. It is no longer in the family and the land is used for cattle grazing. One of Bill Whitten’s sons, George, took my family and me to see the homestead a few years ago. The north and west interior walls were covered with newspapers–later painted and wall papered over. We did find a few still visible papers with dates of 1897 still on the walls. I did spend quite a bit of time at that Hooper homestead as a child. Riding horses was my favorite pasttime there as well as time with my granddad’s second family, Carroll and Phyllis Fultz. One always wonders what those old walls would say if they had a voice! My dad’s father, C.W. Woody came to Salida, Colordo in 1893 to work for the railroad. C.W. (Charlie) Woody came from Iowa, where his family were farmers. Salida was a “railroad” town and Charlie became an engineer on the D&RG (Denver and Rio Grande) railroad. He later owned a restaurant in Salida. He met my grandmother, Ruth Rout, in Salida. She and her sisters walked behind a covered wagon from St. Francis, Kansas. The family was originally from Lewiston, Missouri where Ruth and her siblings were born. Ruth’s brother Clarence and a sister or two came to Salida earlier and then their parents and the rest of the family came in 1894. Her mother, Mary Ellen Barkley Zimmerman Rout wrote a letter that still exists about her doubts about moving to Colorado. Her health was poor at the time of the move. She passed away shortly after the family came to Salida. This grandfather also wanted to ranch near Hooper and moved his family there about 1920. It was in this community of Hooper where my parents, Les Woody and Ethel Fultz met and married in 1924. The house in Hooper was torn down in the early 1980’s and is now a potato field. 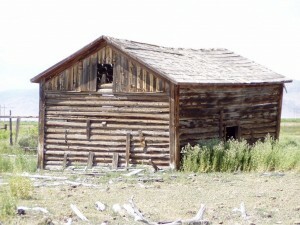 This entry was posted under My Family, Old West Memories & Stories. You can follow any responses to this entry through the RSS 2.0 feed.